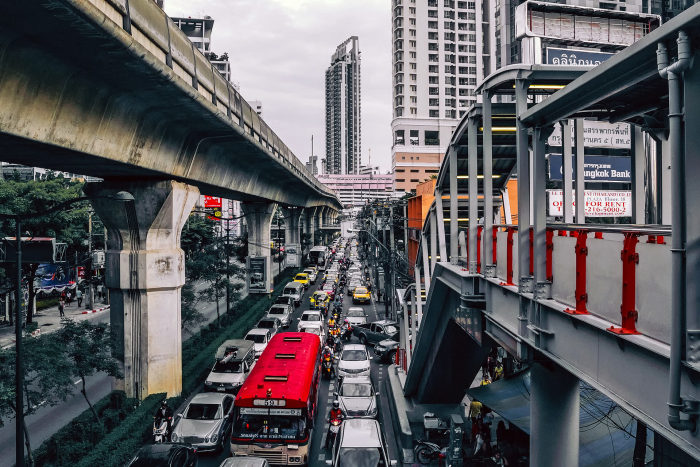 Thailand has recently embarked on a major infrastructure upgrade under the Thailand Transport Development Plan 2015-2022 investing around £60 billion. Around 80% of the total investment will be in the development of its railway infrastructure. Below you will find an overview of the key areas within this development plan, Thai companies and government organisations in the infrastructure space, along with links to Thailand’s Office of Transport and Traffic Policy and Planning (OTP) documents. The UK is keen to work with Thai and overseas partners in the delivery of major rail, airport and Eastern Economic Corridor infrastructure projects that Thailand plans to deliver in the coming years. Thailand currently has around 4000 km of rail network but around 90% of that is single track. In order to improve rail transport efficiency, Thailand plans to invest around £11.5 billion in a number of double tracking projects. In addition to these double tracking projects, Thai government plans to invest around £22.8 billion in 4 high-speed rail (HSR) routes in standard gauge. Thailand also plans to invest in £14 billion in mass transit systems in Bangkok to expand the network from 110 km to 464 km. Four major cities outside of Bangkok have plans to construct light rail transit networks worth a combined £3.8 billion. The State Railway of Thailand (SRT) plan to relocate their central maintenance and repair facilities from Makkasan to Saraburi at a cost of approximately £700 million. SRT also aims to completely electrify the entire rail network within 20 years. The state enterprise Airport Authority of Thailand (AOT) has planned investments of around £4.1 billion to develop six international airports in Thailand for over 10 years (2016-2026). The Department of Airports (DOA) has also budgeted around £900 million to renovate and expand 29 regional airports over the next 9-10 years. The Eastern Economic Corridor (EEC) Development Plan under the scheme of Thailand 4.0 aims to develop three Eastern provinces (Chonburi, Rayong, and Chachoengsao) into a leading ASEAN economic zone, spanning a total of 13,285 square kilometres. The government hopes to turn the area into a hub for technological manufacturing and services with strong connectivity to its ASEAN neighbours by land, sea and air. The government expects £38.5 billion for the realisation of the EEC over the first 5 years through a mix of state funds, public-private partnerships (PPPs), and foreign direct investment. Several large infrastructure projects form a large portion of this investment, namely the High-Speed Train project (£4.4 billion), U-Tapao Airport expansion (£4.4 billion), Laem Chabang Industrial Port phase 3 expansion (£3.2 billion), Map Ta Phut Petrochemicals Port phase 3 expansion (£230 million), Dual-track railway (£1.4 billion), Motorways (£770 million) among many more. Ministry of Transport oversees all transportation, transportation-related business, traffic planning, and transport infrastructure development. It is composed of government administrations, including the Marine Department, Department of Land Transport, Department of Civil Aviation, Department of Highways, Department of Rural Roads, and Office of Transport Policy and Traffic, and state enterprises. State enterprises include the State Railway of Thailand, Port Authority of Thailand, Mass Rapid Transit Authority of Thailand, Expressway & Rapid Transit Authority of Thailand, Bangkok Mass Transit Authority, Civil Aviation Training Centre, Thai Airways International Public Company Limited, The Transport Company Limited, Airports of Thailand Public Company Limited, Thai Maritime Navigation Company Limited, Aeronautical Radio of Thailand Limited, Suvarnabhumi Airport Hotel Company Limited, THAI-AMADEUS Southeast Asia Company Limited, Airport Rail Link, and Thai Smile Airways. MoT also oversees Thailand’s Transport Infrastructure Development Strategies 2015-2022, consisted of 5 major plans, aiming to reduce the cost of logistics and transportation to subsequently improve the competitiveness of the economy. Sitting under the Ministry, OTP is responsible for submitting policies, formulating transport and traffic plans, and working out transport safety measures that are consistent with the master plans so as to bring about the unity of the national transport and traffic policy. It is within OPT’s mission to make comprehensive studies and analysis, set up the information database system, supervise and expedite the operations of agencies under the Ministry of Transport, and carry out the continuous assessment of their performance in compliance with plans, projects, and budget constraints. A state-owned rail operator under the jurisdiction of the Ministry of Transport. As of 2018, the network serves 47 provinces and around 35 million passengers annually. The passenger count is expected to double by 2027 when expansion plans are realised and the network grows to serve 61 provinces. Most of Thailand’s roughly 4,000 km rail network is single track. A government initiative to move air and road transport to rail passed a major milestone on 28 December 2017 when the SRT signed nine contracts with private contractors to complete double tracking on 702 km of the SRT network. This first phase of the double-tracking project will cost 1.7 bn GBP. The government’s aim is to reduce the nation’s logistical overhead, some 41 bn GBP, by moving air and road freight to rail. As of the contract signing date, 86 percent of Thailand’s freight moves by road and only two percent by rail. The second phase will add a second track to 2,217 km of single track over nine rail links at a cost of 9.7 bn GBP. Government plans to call for an overall investment of 14.7 bn GBP to create 2,588 km of double tracks. In addition, SRT also operates a 28-km airport rail link which directly connects Bangkok airport with central Bangkok and a soon-to-opened Dark Red Line (to North Bangkok) and Light Red Line (to West Bangkok). Another major scope under the authority of SRT are the four high-speed rail projects (North, South, East, South-East) totalling a distance of 1,038 km. An agency under the Ministry of Transport responsible for the operation of rapid transit systems in the Bangkok Metropolitan Region and including other provinces as defined by the royal decree. The company oversees the operation of the Bangkok Mass Transit System (BTS Sky train) and Metropolitan Rapid Transit (Underground Train). The majority of train lines are under the responsibility of MRTA including blue, purple, light green, dark green, pink orange and yellow. This remit encompasses the majority of the Ministry of Transport’s 20-Year Mass Rapid Transit Master Plan for the Bangkok Metropolitan Region called M-Map1 in which 5 lines are currently in operation covering a distance of 109.8 km, which will be further expanded to 10 lines in its final state and stretching to an overall 464 km in total. In addition, MRTA also oversees transport developments in 4 major regional cities, including Phuket (41.7 km), Chiang Mai (40 km), Nakhon Ratchasima (21 km), and Khon Kaen (22.8 km), all of which are Light Rail/Tram projects. Bangkok Mass Transit System, a subsidiary of BTS Group Holdings, operates an elevated mass transit system in Thailand under a concession granted by the Bangkok Metropolitan Administration. Its core BTS Sky Train System comprises 2 major lines, Sukhumvit (Dark Green Line) and Silom (Light Green Line), covering 43 stations. BTS also covers two other segments which are Media and Service, providing advertising services on Bangkok Mass Transit System and department stores, as well as offering outdoor and other advertising services. Additionally, it invests in securities of other companies; provides Web portal services and design services; arranges various e-commerce-related activities, including online marketing services; leases property; and purchases and sells electronic billboards, as well as providing direct sales services for various types of products through telesales. A private transportation company operating two metro lines in Bangkok and expressways. Under 25-year concession agreements with the Mass Rapid Transit Authority of Thailand, BEM operates the MRT Blue Line and MRT Purple Line. BEM also won contracts to build and operate three expressways including Si Rat, Si Rat-Outer Ring Road, and Udon Ratthaya. BEM manages revenues and all commercial activities, including advertisement, leasing, and information and technology services within the Blue Line stations for 30 years. A privately-owned construction company specialised in construction equipment, hospitality, and lifestyle. 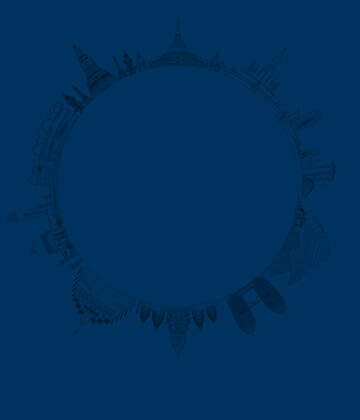 Italian-Thai under Italthai Group employs more than 5,000 employees in 7 continents across the Asia Pacific region. The company’s portfolio is populated with projects in Thailand and over the region, comprising of Suvarnabhumi Airport, track doubling project, highways, expressways, a central department store, North Bangkok Combine Cycle Power Plant, Map Ta Phut Port, BTS Skytrain Sukhumvit Line (Dark Green), Nam Theun 2 Hydroelectric Project, and ICONSIAM being its most recent project. STECON is an engineering and construction company, established in 1962. The company has worked in both government and private projects in civil and mechanical works including high value-added projects which require technology and expertise. Their works can be categorised into infrastructure, buildings, energy, industrial works, and environmental works. Some examples of their works include MRT Purple Line, BTS Thonburi Extension (Light Green Line), Airport Rail Link, Srirat Express Way, Air Traffic Control Tower Suvarnabhumi International Airport, Aircraft Maintenance Centre U-Tapao Airport, Nestle Warehouse (South Bangkok), Buriram United Thunder Castle Stadium, Bangkok Government Office Centre, Rayong Refinery (Shell), Siam Styrene Monomer Plant, Waste Water Collection System and Treatment Plant Kanchanaburi. The company began engaging in the general construction business and has covered construction of buildings and general civil works, with its major clients being government agencies, for example, the Royal Thai Army and Royal Thai Air Force. It later enlarged the scope of work through joint ventures with Japan, Germany, and the UK while expanding their expertise to become one of a few construction contractors which are sufficiently well prepared to carry out sophisticated construction requiring advanced construction technology. The company’s projects range from track works/underground structure, MRT Green/Blue/Purple lines, Bangkok airport developments, Thai Airways catering building, a solar power generating facility, Bangkok wastewater tunnel project, and many more. An established construction company in Thailand with expertise from the management of projects to selection of advanced technologies in creating works that meet high standards and deadlines. The Company has carried on its operations and placed emphasis on medium-to-large public utility construction which requires expertise in the management of projects and the selection of advanced technologies that are suitable for each construction type, such as steel bridges, reinforced concrete bridges, tunnels beneath intersections, concrete-surfaced or asphaltic concrete roads, public utility works, structural work, building work, dams and retaining walls. The company’s portfolios consisted of many large-scale public projects, including the Red Line Project (Bang Sue – Taling Chan Section), Mass Rapid Transit (Blue Line), Chalong Rat Expressway (Ram Inthra – Outer Right Road, new Phra Nang Klao Bridge and many more. One of Unique’s on-going projects is Thailand’s new Grand Central Station and depots, a contract awarded by the State Railway of Thailand. A construction contractor with major operations in Thailand and Southeast Asia; it is today a listed company majority owned by the GP Group. The company provides a comprehensive range of construction services, including the design and construction of a variety of buildings and civil engineering works, and steel structures with a full range of electrical and mechanical engineering services. Since establishment in 1930, the company has been responsible for a number of landmark projects including the Democracy Monument, Klong Toey Port, Krungthep, Krungthon and Nonthaburi bridges spanning the Chao Phraya River in Bangkok, the Rajdamnern Boxing Stadium, the Sukhothai Hotel in Bangkok, the luxury Baan Taling Ngam Resort Hotel on Koh Samui and the Asian Games Sports Stadium. A big part of its work also covers educational facilities, factories, and head offices. Last but not least is the work on highways, and BTS Skytrain Green Line Extension Project (S9, S10, and S11). The company provides services including electrical systems, telecommunication systems, air conditioning systems, plumbing & sanitary and fire protection systems, and civil construction for both private and government sectors through being the main contractor and sub-contractor. The company’s pending and completed projects vary from the Metropolitan Electricity Authority Office Building, Suvarnabhumi Airport Satellite 1 Extension, Parliament, AEC Market, Intercontinental Hua Hin Resort, Four Seasons Residence, industrial factories, to overseas residential construction in Qatar. Thai Obayashi, a total engineering corporation, started out with a focus on industrial construction and expanded its scope to include urban and resort development. It aspires to undertake the complete scale of a project from survey, design, construction, to maintenance and management. The company has experience in various aspects from airports, government buildings, transport depots and warehouses, hotels, and many more, with an increasing focus on the environmental factor. Its works include Siam Paragon, Tesco Lotus, AIA Sathorn, Siam Commercial Bank Head Quarter, St. Regis Hotels and Residence, Suvarnabhumi Airport Concourse Building (Sub-Structure), factories, and many more.